how can you expand the text box in version 5 all along the line? If you first tap one of the corners of a text box to highlight it (as shown), you will be able to drag any edge vertically or horizontally. Thanks for the follow-up. 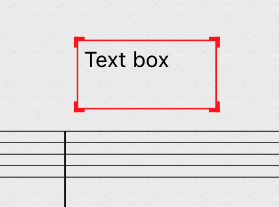 The next update (5.0.6) in a few days will allow these elements to have any width, but until then the Lyric tool can be a good workaround, or even a better solution. It's available under Score Symbols Expandable Button > Text, then look for the L1..L6 expandable button.